On the Universitätsplatz ("University Square"), a farm market takes place every Monday to Friday. The square leads up to another elaborate Baroque church of Salzburg, the Kollegien- or Universitätskirche. It was built under the management of Johann Bernhard Fischer von Erlach (who also built Markuskirche and Dreifaltigkeitskirche) and dedicated to "Unserer Lieben Frau" (Our Blessed Lady). Attached to the church you can find a lovely piece of green, the Furtwänglerpark, and the oldest buildings of Salzburg University. The Kollegienkirche was built between 1696 and 1707. 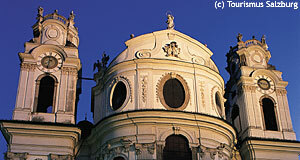 On the top of its façade you can see four statues, the interiors of the church are filled with elaborate stucco works, angels and a Maria Immaculata statue framed by the four evangelists as a central eye-catcher. Instead of an altar, the Kollegienkirche initially held only a tabernacle of stone; however, today the church does have an altar as a basis for it, a construction from 1735. Look at the seven pillars of red marble in the centre hall: they are occupied on top by angels, with Archangel Michael in the centre. The altar scenery was made by Josef Anton Pfaffinger, whereas Fischer von Erlach and Diego Francesco were responsible for the Maria Immaculata. The elaborate side nave altars bear remarkably intense colours. The altar paintings on the left hand side were made by Johann Michael Rottmayr in 1721 and depict St. Barromäus. The painting is flanked by St. Rupert and St. Virgil. The altar paintings on the right hand side is flanked by St. Erentrudis and St. Scholastika and was painted by Rottmayr, too, only a year later in 1722. It depicts St. Benedict baptising a pagan chief. The statues in the side chapels refer to the "Fakultäten", the schools of the University: St. Thomas of Aquin (school of theology), St. Luke (school of medicine), St. Ivo (school of law) and St. Catherine (school of philosophy).